Chianti Classico wine tasting tour - Chianti Classico wineries. As for all of our tours, your transport will be a comfortable, air-conditioned minibus, and Angela will provide a continuous commentary on the various sights and vineyards that you pass by. During the tour we will drive through some of the most scenic landscape in Italy. This tour focuses on the production and oenological characteristics of high quality DOCG Chianti and Chianti Classico wines within the territory around Greve in Chianti. 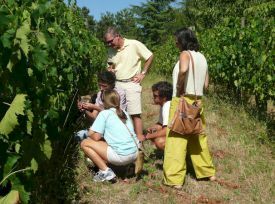 At the first Chianti vineyard we will do a cellar tour, a wine tasting, and also an olive oil tasting. Angela or the cellar master will describe the production and also the distinguishing characteristics of the wines that you taste. 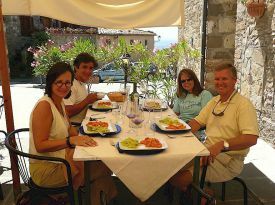 We will then drive on to a second Chianti vineyard for lunch together with a further Chianti wine tasting. This will be followed by a visit a charming mediaeval village - either Montefioralle, home of the family of Amerigo Vespucci, or San Donato in Poggio. Time-permitting, we will take a walk around the shops in the piazza of Greve in Chianti. • 9.30 a.m. Departure from Florence. • 10.30 a.m. Arrival in the Chianti wine territory to visit the first winery and taste the wines. • 1.00 p.m. Lunch at a local trattoria, pizzeria or at the winery. • 4.00 p.m. We visit a mediaeval village such as San Donato in Poggio or Montefioralle.